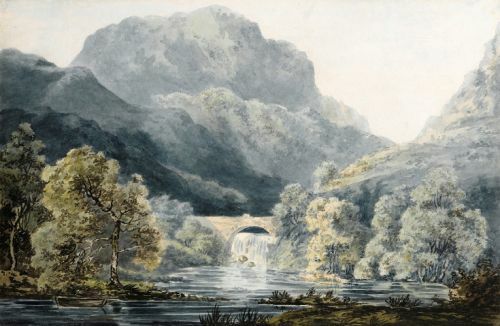 Pont Aberglaslyn, the bridge spanning the beautiful narrow Aberglaslyn gorge in North Wales, is one mile south of Beddgelert, a popular base for watercolour artists in the late eighteenth and nineteenth centuries. 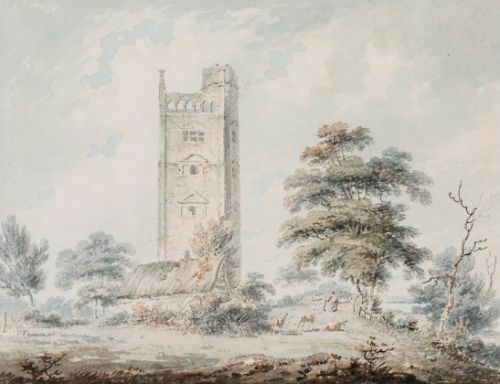 Dayes was one of the most important British topographical artists of the late eighteenth century whose work was very influential on the young artists, Turner and Girtin. He worked in the eighteenth century manner with a restricted palate mainly of greens and blues. Dartmouth Castle is a coastal fort guarding the mouth of the River Dart estuary in Devon. 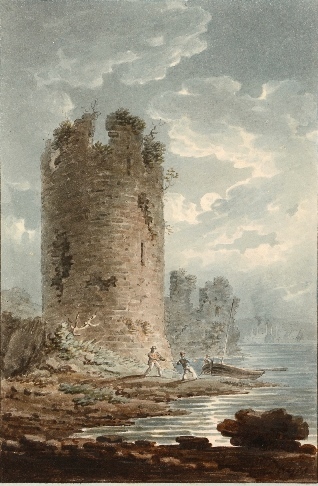 Begun in 1388, the castle comprises of a two towers, one round and one square, the whole of which is built upon a rocky promontory, very close to the water's edge. 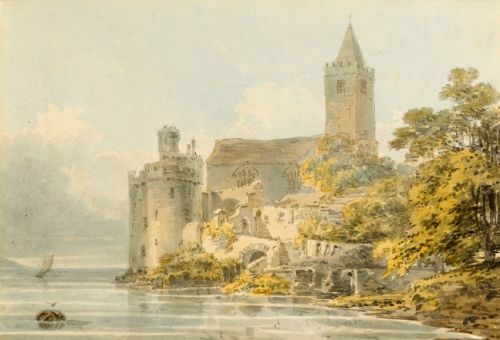 Dayes’s view of the castle from the Dartmouth side of the estuary highlights the dominant position of the Church of St Petrox directly behind the castle. With a history dating back to Norman times, the present chapel was built in 1647, looking much as it did today, but without the spire which was removed in 1856 when the lighthouse on the other side of the promontory was erected. 31.8 by 40.9 cm., 12 ½ by 16 in. 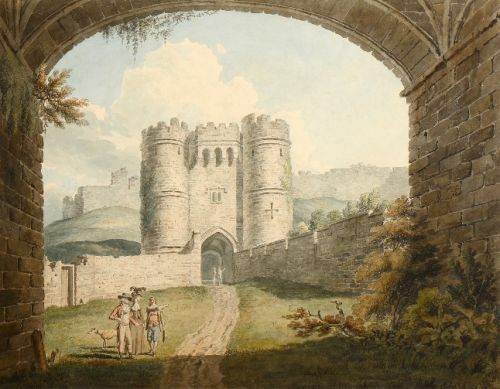 Dayes is one of the most important British topographical artists of the late eighteenth century whose work was very influential on the young artists, Turner and Girtin. He worked in the eighteenth century manner with a restricted palate mainly of greens and blues. Two Isle of Wight views by Dayes, `Freshwater Bay’ and `Undercliff’ are in the Tate Gallery. 16.6 by 11 cm., 6 ¾ by 4 ½ in. Flint Castle stands on the banks of the river Dee to the north-west of Chester. It was the first of Edward I’s castle built in the late 13th century as part of his plan to conquer Wales. 163 x 214 mm., 6 ¼ x 8 ¼ in. 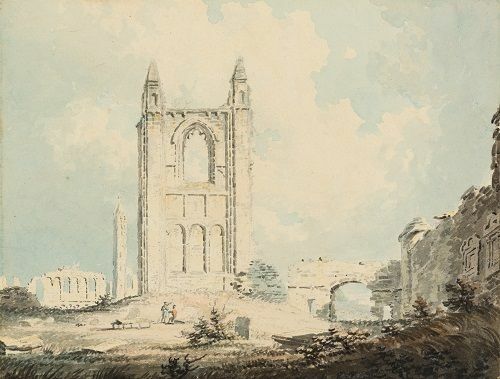 This may be of the watercolours based on sketches by the antiquarian James Moore which were engraved for `Twenty-five Views in the southern Part of Scotland’ published in 1794. Stylistically it dates from this period when Dayes was a particular influence on the young Girtin and Turner. St Andrew’s Cathedral was the largest church ever built in Scotland. During the Reformation the interior was ransacked by followers of John Knox in 1559 and the church fell in ruin afterwards.